Vanilla bean salt has been something I’ve used for baking over the years. It’s a little extra something that I love to sprinkle over cookies and brownies before baking, as well as folding it into pancake batters and cakes. I’ve made it a variety of ways over the years and splitting a vanilla bean in half and sticking it into a jar of sugar was the way I started. Then, I started scraping the vanilla caviar and rubbing it with the sugar, to get maximum contact. And ultimately, I came up with this method. It’s a way to NEVER have to throw away a vanilla bean and some people might be shocked at what I do, since I grind the ENTIRE bean, but it works for me, giving me so much more flavor than I ever imagined. Normally, you use vanilla beans by scraping the insides. Then you save the outer shell and maybe drop it into a custard mixture. It’s then strained out and (hopefully) rinsed off and set to dry. This is what we were taught to do at CIA, because you could use a bean a few times. So, what do you do when you have a few split and dried beans? You chop them up, throw them in a spice grinder and grind them to a fine dust! I’ve included the method below and as you can see, the salt is finer than kosher salt. We had some extremely coarse sea salt in the pantry that we never used and I decided to just pulverize that and use it as my baking salt. This is a great post by Joy the Baker on What’s the best salt for baking? and another post by Shauna Sever on Why Salt Is Important in Baking, both informative reads so be sure to stop on over there. Use this salt not only in baking, but vanilla pairs very well with pork and lobster, so be sure to give it a try in some of your savory dishes for an unexpected burst and balance of sweet and salty. Have used vanilla beans laying around your pantry? 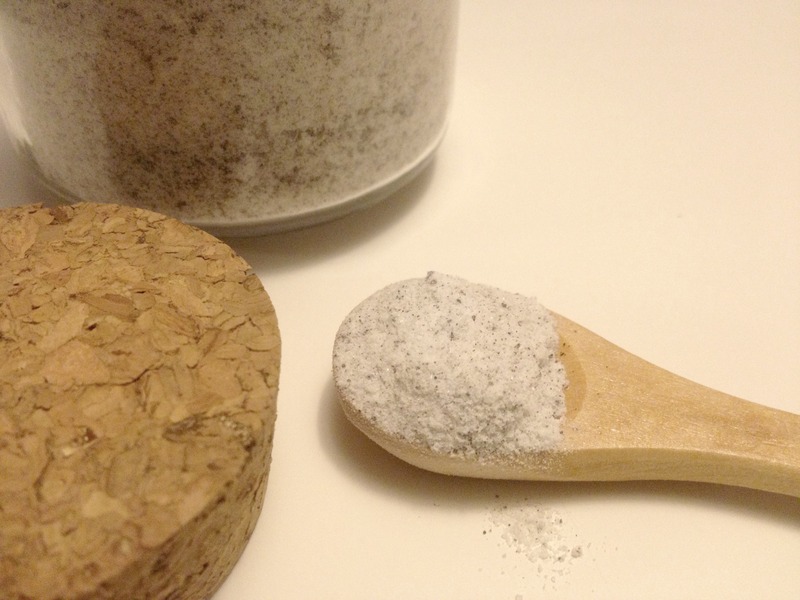 Make Vanilla Bean Baking Salt - a great way to repurpose vanilla beans! Before you get started, make sure your spice grinder is clean. An easy way to clean it is to throw a few pieces of fresh bread in it and pulse. The bread will pick up any leftover spices/coffee. If using coarse sea salt, pulse the salt a few times in the grinder until desired texture. Your vanilla beans should be dried, but if you'd like to use new beans (extra flavor), split them open and dry out in your oven until they are brittle to the touch. Cool. Grind complete vanilla beans and place in small bowl. Whisk with salt. Keep in a cool, dry place and use in your cooking and baking! Interested in these adorable cork & wooden spoon jars? They’re from Freund Container & Supply, specifically the Round Glass Jar w/Cork & Wooden Spoon. They’re perfect for storing baking spices such as this vanilla salt, as well as candy, tea, and small trinkets! I was provided with samples of jars for the purpose of this post. « So You Want to Write a Cookbook? What a wonderful detail and I love to repurpose whenever possible!